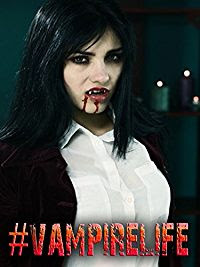 Vampire Beauties: Vampiress Review: "#VampireLife"
The Gist: Two stories that deal with women being attacked by vampires. Clarification: In the first tale called "Money, Vampires and Weed" three girls get held hostage by a woman who stole a large bag of money from a vampire. In the second story "Crimson" a group of medical students help a woman who was attacked by a group of vampires who are looking for her. Selling Point: All the stories do revolve around women. Female Vampire Factor: I've already reviewed the film Crimson which you can view HERE. I will mention the one presented here is a thoroughly edited down version which takes out a lot of the stuff I complain about in my original review so the enjoyment factor on this version is much higher. The first movie "Money, Vampires and Weed" on the other hand was my first time watching that and I have to say I was entertained. It wasn't bad entertaining it was dumb entertaining. Basically you take the premise of the first "Purge" movie but replace the purgers with a vampire wanting his money and replace the family with three ditsy college students with the dumbest one being the blonde pot head who pretty much just let's the vampire in and talks to him like nothing is going on. SPOILER ALERT The only negative takeaway is the fact that when the payoff actually does happen at the end it's so brief you barely see it. If you're going to watch a version of Crimson definitely get this film and not it's original format. I give the DVD a Vampire Beauty Rating of 4 out of 5 just based on that with "Money, Vampires and Weed" just being a decent bonus.